I have this beautiful baby girl who seems to be growing out of her clothes at an incredible rate! So, I'm trying to get ahead by making her some clothes for the fall. A comfy long sleave knit dress. I used the sleave of an existing dress to measure how long to make my new sleave. I just lined up the bottom and traced the curve of the shoulder. Next I lined the center seams up so the shirt layed flat. I used the pink dress again (or you could use a shirt the right size) to cut a new shoulder, armhole, and side. and cut the other side to match. Here are all my pieces now and how they'll line up. I ended up trimming a bit of the top of the skirt piece to make it the right length. I also hand stitched the front closed most of the way up. 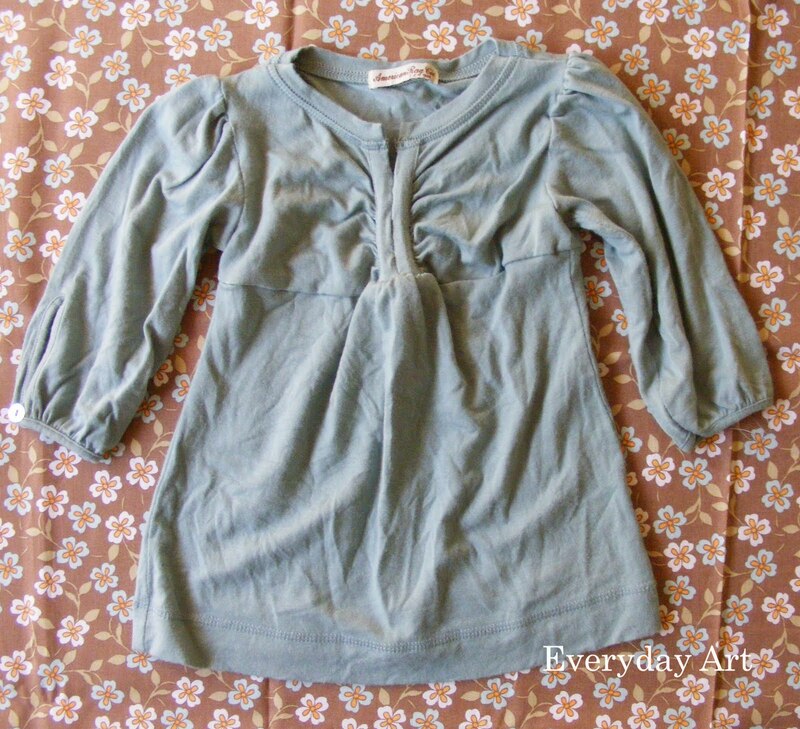 Turn the top inside out and sew the shoulder and side seams. I gathered the top of the sleave so it fit the arm hole. To gather, sew a basting stitch, hold on the one thread and push/bunch the fabric together. Make sure to even out the gathers (not tight in one spot and loose in others). I also gathered a bit in the front and back of the skirt piece so it fit the top of the dress. I sewed a seam from the arm pit to the end of the sleave along the bottom side of the sleave to make the sleave the right width. Then cut off the extra. With the right sides of the fabric together sew the skirt to the top and the sleave in the arm hole. Turn it right side out and you're done! I also made a little hair clip out of the scraps- why not. 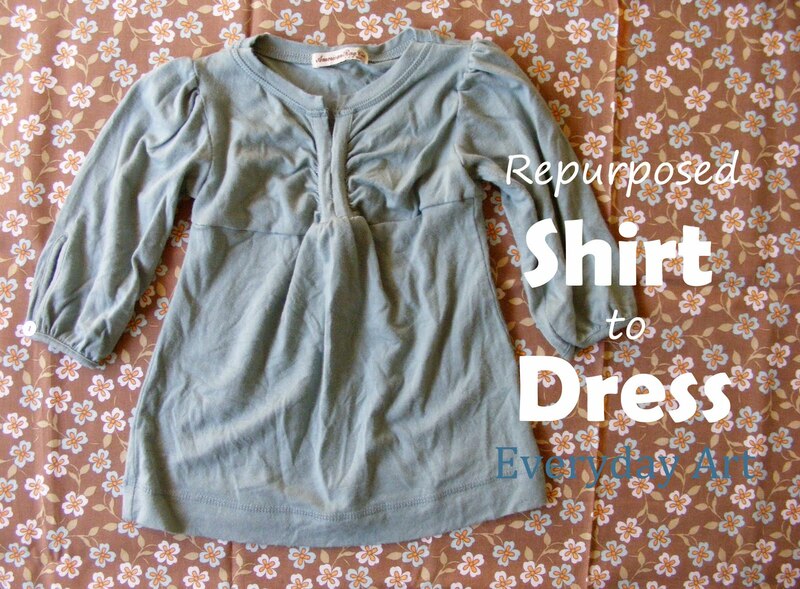 So I reallize the chances of someone having this same shirt and wanting to make it into a dress are pretty slim, but I figured you might have something similar, or it might just give you an idea of how to reuse something from your own closet. Enjoy your cute new baby dress and the fact that it was free! That is the cutest baby dress. Thanks for sharing. Wow-what a wonderful transformation! Thanks for your fabulous tutorial! This is brilliant!! I love how it turned out. 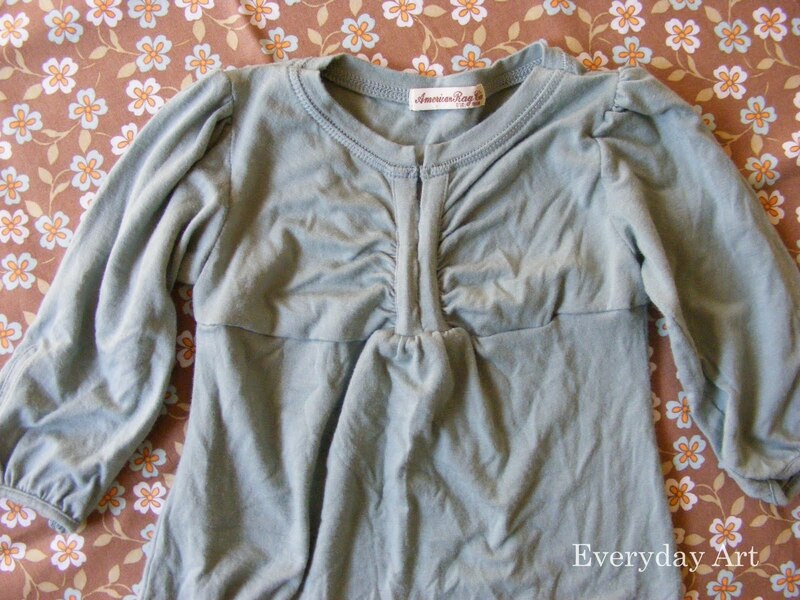 I am going to go through my closet and find an old shirt to use to try this! Thanks for a great tutorial. And thank you so much for linking up to Strut Your Stuff Saturday- we would LOVE to have you come back tomorrow and link up more of your great posts!